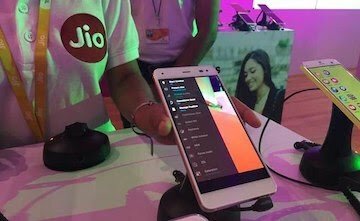 Reliance Jio's new prepaid recharge plan priced at Rs 299 offers 3GBs of 4G high speed per day data for a period of 28 days. Jio's new Rs 299 prepaid recharge plan also offers benefits of unlimited calling, free SMSes and complimentary subscription to host of Jio apps. In a major push, Jio revised most of its existing prepaid plans on January 26 to offer more benefits at fewer prices. Jio's new Rs 299 prepaid plan is part of this 'Republic Day offer' of Jio which was also revised on January 26. Jio's prepaid recharge plan priced at Rs 299 now offers 84GBs of 4G high speed data for a period of 28 days with a daily cap of 3GB per day data. After the exhaustion of daily data limit, the internet speed gets reduced to 64Kbps. Jio introduced Rs 299 prepaid plan in December 2017 as part of its 'Happy New Year Offer' which then offered 2GB daily data for a period of 28 days. The total data available with this plan that time was only 56GBs. 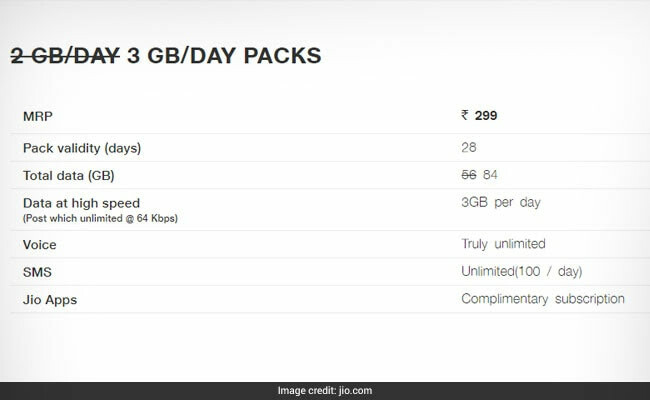 After the latest revision, Jio's Rs 299 prepaid plan is now offering total of 84GBs data. This prepaid recharge plan priced at Rs 299 also offers unlimited local, STD and roaming voice calls. Customers also get subscription to host of Jio apps for one year with this plan. 100 free SMSes are also bundled with this prepaid recharge plan. Jio's Rs 299 prepaid recharge plan is valid for 28 days.